Each set of the adjustable legs come in black with 4 legs, top sockets and 2 toe clips for your convenience. 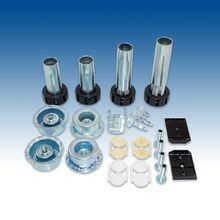 These small adjustable cabinet legs will adjust from 3.69” to 6.28” depending on your needs. This versatile line of adjustable cabinet legs is stocked in Outwater’s New Jersey and Arizona facilities, enabling us to provide faster and more cost-effective shipping for all customers. If you are having difficulty finding the adjustable cabinet leg that works best for you, contact our friendly sales department for more information on Outwater’s entire collection of furniture, cabinet and table legs. 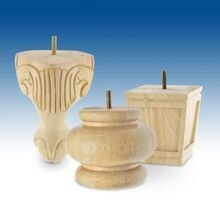 These furniture legs offer a stylistic and design-friendly appearance to enhance the look for your furniture pieces. 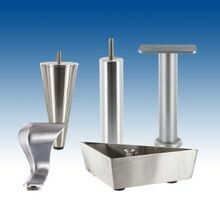 Our round tapered furniture legs are manufactured from materials such as steel, cast aluminum and high-density polyurethane. This series of furniture legs is stocked in Outwater’s New Jersey and Arizona facilities in order to provide faster and more cost-effective shipping for all our customers. If you are having trouble finding the furniture leg that meet your needs, contact our knowledgeable sales staff for more information on Outwater’s entire collection of furniture, cabinet, table and appliance legs. If you’re having trouble finding the product that meets your needs, contact our friendly sales department for more information on our collection of bun feet, as well as other products offered by Outwater Industries. The entire line of bun feet is stocked in Outwater’s New Jersey and Arizona facilities. This allows us to provide more cost-effective and faster shipping to our customers on both the East and West coasts. The table and island legs line is available in a number of different heights and sizes, and many of the legs come equipped with the mounting hardware needed for an easy installation. Outwater stocks the table and island legs line in our Arizona and New Jersey facilities in order to provide faster and more cost-effective shipping for our customers. If you cannot find the table or island leg that meets your needs, contact our friendly sales staff for more information on the entire collection of table and island legs, cabinet, furniture and appliance legs. 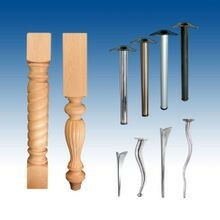 A selection of these legs offer height adjustments of up to 1-1/4”, 1-3/4”, and 2”. 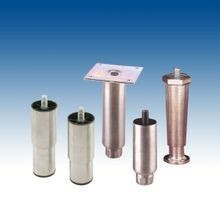 These legs are offered with mounting plates or threaded stems depending on your preference and are available in several styles as well. Outwater stocks these versatile and durable appliance and equipment legs in our Arizona and New Jersey facilities. This allows us to provide more cost-effective shipping for our customers. If you are having trouble finding the leg that meets your needs, contact our knowledgeable sales department for information on the entire collection of legs that Outwater has to offer. Each series in the collection of legs is manufactured from durable and long-lasting materials such as steel, aluminum, ABS plastics and more. These legs can be used with a variety of different tables, sofas, TV stands, and workbenches depending on the series of legs. The collection of legs can also be used in a range of environments such as residential homes, department stores, hotels and more. 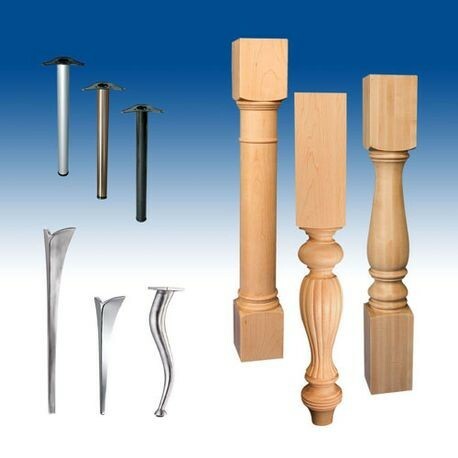 This exclusive collection of legs is also available in a range of finishes, which depends on each series of legs. Outwater stocks the entire collection of long furniture legs in our New Jersey and Arizona warehouses in order to provide fast and cost-effective shipping for customers throughout the country. If you are having trouble finding the leg that meets your needs, contact our knowledgeable sales staff for more information on Outwater’s entire collection of legs and other unique products.